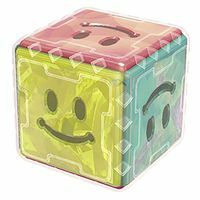 Grumblumps are block-like obstacles that make their debut in Super Mario 3D World, which are large, multicolored crystal blocks. They only appear in Grumblump Inferno. They can be either cubed or rectangular in shape. Once the player steps on a Grumblump, the smiling faces turn into frowning faces, and it starts gradually moving along a set path through the lava in the level, turning over on one of its sides at a time (Grumblumps act as the only means of traversing these parts of the level). As it moves, the player must move with it to stay on top of the side currently facing upward and avoid falling into the lava until it reaches the end of its path. The player can walk up the sides as it's turning, similarly to a Triangular Block. A Grumblump in Grumblump Inferno. A Grumblump may also encounter a slope along the way, at which point it will slide down on the side currently facing downward. If the player Ground Pounds a Grumblump, the faces will turn angry, and it will move faster for a short period of time. Occasionally, two Skipsqueaks appear on either side of the player to serve as guides for timing running and jumping movements when trying to stay on top of the Grumblump. Although they are visually similar to Rhomps and Tox Boxes, they act differently, since they are used as platforms that are constantly rotating. They cannot crush the player since they are above lava, and the lava below them kills the player, rather than the Grumblump rolling over them. Gotogoton From goton-goton, an onomatopoeia for rumbling hard object such as a stone. This page was last edited on February 20, 2019, at 21:41.